Why has Google cast me into oblivion? What it means is that a blog I wrote in 2007 will no longer be findable when searching on Google in Europe. Which means that to all intents and purposes the article has been removed from the public record, given that Google is the route to information and stories for most people. So why has Google killed this example of my journalism? Media captionRobert Peston: Removed article "was in public interest"
Well it has responded to someone exercising his or her new "right to be forgotten", following a ruling in May by the European Court of Justice that Google must delete "inadequate, irrelevant or no longer relevant" data from its results when a member of the public requests it. The ruling stemmed from a case brought by Mario Costeja González after he failed to secure the deletion of a 1998 auction notice of his repossessed home that was reported in a Spanish newspaper. Now in my blog, only one individual is named. He is Stan O'Neal, the former boss of the investment bank Merrill Lynch. So there is an argument that in removing the blog, Google is confirming the fears of many in the industry that the "right to be forgotten" will be abused to curb freedom of expression and to suppress legitimate journalism that is in the public interest. To be fair to Google, it opposed the European court ruling. But its implementation of it looks odd, perhaps clumsy. Maybe I am a victim of teething problems. It is only a few days since the ruling has been implemented - and Google tells me that since then it has received a staggering 50,000 requests for articles to be removed from European searches. It has hired what it calls "an army of para legals" to process these requests. PS Although the BBC has had the notice from Google that my article will not show up in some searches, it doesn't appear to have implemented this yet. My blog remains findable when you search Stan O'Neal. So I am beginning to wonder whether it really was him who requested to be forgotten. The implication is that oblivion was requested not by anyone who appears in the blog itself (O'Neal is the only person I mention in my column) but by someone named in the comments written by readers underneath the blog. Google won't tell me, one way or another. It is all a bit odd. So there have been some interesting developments in my encounter with the EU's "Right to be Forgotten" rules. It is now almost certain that the request for oblivion has come from someone who left a comment about the story. So only Google searches including his or her name are now impossible. Which means you can still find the article if you put in the name of Merrill's ousted boss, "Stan O'Neal". In other words, what Google has done is not quite the assault on public-interest journalism that it might have seemed. Unless, that is, you believe that when someone makes a public comment on a media website, that is something that is voluntarily done and should not be stricken from the record - except when what is at stake is a matter of life and death. What may be a concern is that this opens the door to a torrent of requests from people who have left comments on blogs and websites now asking Google to, in a sense, strike those comments from the record. As it happens, the idea that Google has gone a bit over the top in restricting searches to my blog has been made by Ryan Heath, the spokesman for European Commission vice-president Neelie Kroes - who I have just interviewed for Radio 4's PM programme. 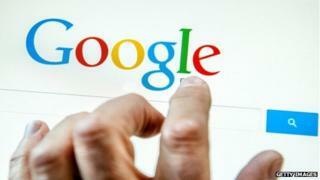 Google insists it is simply complying with the relevant articles in the European Court of Justice's ruling.